I come home with blood on my shirt. A single speck, the size of the end of a pin, a smear the shape of a tiny moon. I throw the shirt in the washer but can’t bring myself to push the start button. Instead I stare at the stains, mystified and overcome. I recall being at the bedside of my daughter, her face contorted with pain. Her left leg is in the crook of my right elbow. Her husband is on her other side, same position, like a mirror image. A doctor is between us and she calls out, “Push!” My daughter pulls on the end of a white knotted sheet, the other end held by her friend who is also a dooula. It is a merciless tug-of-war, Lovelle’s face flushed with agony and the wild strength of a lioness. We count through the contraction. She leans back again, her face on the pillow, hair splayed all around her like a mane. She has never looked more beautiful to me. She is quoting Hebrews 12:1, “Therefore, since we also have such a large cloud of witnesses surrounding us….Let us run with endurance the race that lies before us.” She doesn’t know this is my life passage, the place I return to again and again when it feels like I can’t take another step, that she has spoken exactly what I needed the weekend before I am to become a grandparent myself. My thoughts are broken by the doctor’s voice, “Push!” My daughter strains and we shout. I tell her over and over again, “You can do this! You are doing this. You are strong. You are brave.” We are the great cloud of witnesses in this moment. Then the doctor is holding a baby and we are whooping and weeping. My granddaughter, Eula Ellen, is here. I am in awe. I am in love. I am witness to a miracle. I lean over my daughter, brush the matted hair back from her forehead. The sweat of her labor and salt of my tears run together like a tiny river onto the white sheet. The scenes of our story flash before me: Almost a decade of infertility for me, almost two decades of hardship for her, almost four years since God brought us together as mother and daughter and exactly three years to the day since we’ve officially become a family. I may have never experienced physically giving birth but there is something in the laboring I understand in my bones. The pushing through the pain and tears and exhaustion and the temptation to give up hope. Perhaps that’s why I’m reluctant to wash away the stains on my shirt. They feel like holy reminders, like badges of honor. I hold my granddaughter for the first time the next day. I put my cheek against hers, breathe in her skin, whisper to her that she is loved and strong and she is going to grow up to be a fiercehearted woman. 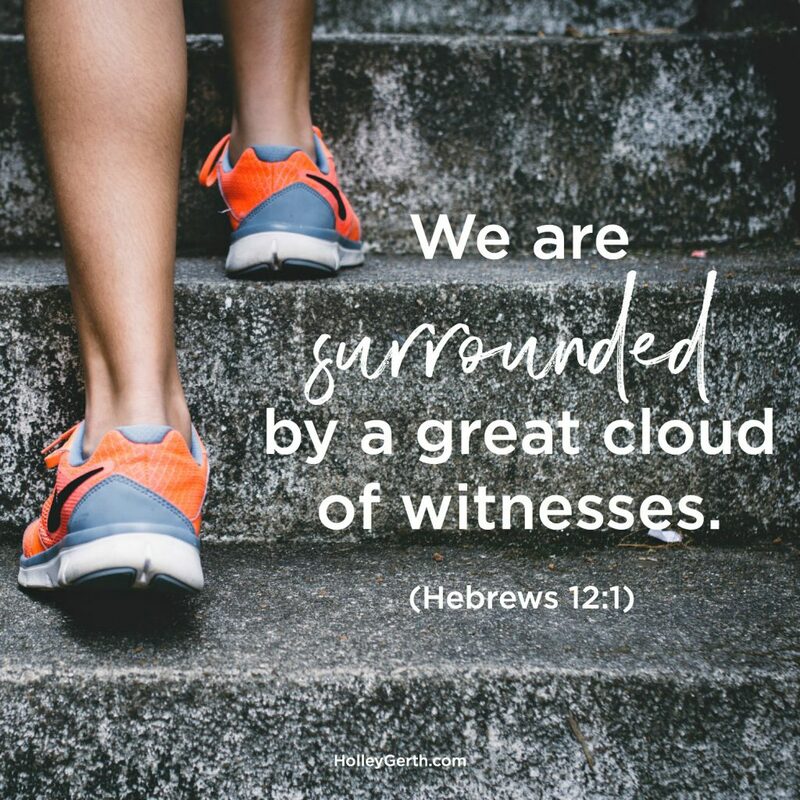 The great cloud of witnesses watches. I can almost hear the cheers. P.S. Thank you to each of you for following along, over the past several years, with this miracle-story. And a special thanks to those who shared on Instagram and Facebook last week that you were praying for Ellie’s delivery. We are overjoyed that she is here! Holley, the way you yield your heart to God’s purposes and continually join Him in His work is inspiring and beautiful. What a blessing for God to give you this gift of being a mother and now a grandmother in the most unusual but perfectly appointed way. I say frame that shirt and don’t wash it — it’s a worthy badge of honor and a memorial to a gloriously kind God. I am in tears…tears of joy for you all. This is another beautiful restoration story, as could only be birthed by our loving Lord. What a perfect labor of love message for this Labor Day. Peace to you, and prayers of thanksgiving for you Holley, and for sharing your lovely family with us. Exquisitely told, dear Holley! Congrats, best wishes, prayers for the long journey that is just beginning! All three of you are good, gorgeous, strong. Welcome to the wonderful world of grandparenting, friend. You’re gonna ace this!! So beautifully written and shared! As always, Holley, you touch my heart with your precious gift of words and encouragement! Congratulations to you all on your beautiful little miracle! Holley, this is so beautiful! God’s blessings and my love! You are an overcomer who smiles in the face of adversity. Thank you for your inspiration and encouragement and for showing us that God does restore beauty for ashes. 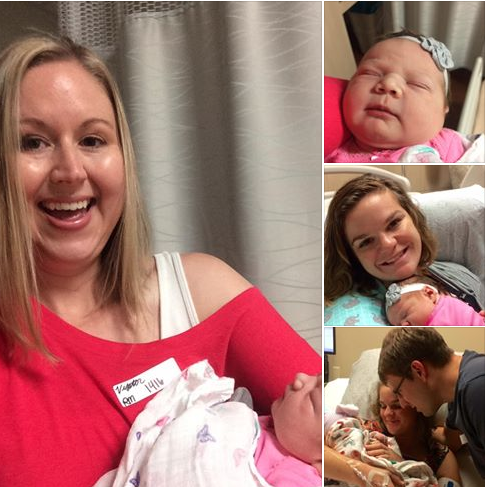 Congratulations on the birth of your FIRST grandchild! Congratulations! Your daughter is blessed to have you as a mother and grandmother to her daughter!! There’s nothing like being a grandma!!! I get all starry-eyed for all my six grandkids! Holley I just love your story! It’s a perfect example of how the death of one dream doesnt mean another dream won’t be the best one! Thank you for sharing that hope today. Congrats, she is beautiful! Congratulations to you Holly and to your family!! What a wonderful God we serve! HE is the God of restoration and HE gives us more than we can ask, think or imagine. What a beautiful blessing she is!! Thank you for sharing your heart with us! Congratulations, Grandma! What a priceless gift you all have been given! Your reluctance to clean your shirt reminds me of our reluctance to clean a perfect handprint from one of our grandkids off our windows. 🙂 Grandchildren are so precious, and I’m so happy for Eula that she has a grandma like you! I have followed your story both on your blog and Lovelle’s, and it truly is a miracle how God brought you both a family. Thank you for continuing to encourage us through your blog and books! Blessings and hugs! XOXO! I’m so grateful for you! I could not love YOU, these words, your family, God’s story in your life any MORE!! I am in tears Holley. What an incredible grace gift God and your grandpa sent to you, just when you needed it. You are the most amazing FIERCEHEARTED woman I know. Wow, just wow.